proton pump inhibitors 또는 항생제를 같이 복용시킵니다. 뜨겁거나 매운음식을 피하고 악성빈혈이 있는 사람들은 B12주사를 맞기도 합니다. 관절염 등 만성질환 환자가 통증으로 복용하는 많은 약들이 위염을 일으킬 수 있습니다. Gastritis is an inflammation of the lining of the stomach, and has many possible causes. The main acute causes are excessive alcohol consumption or prolonged use of nonsteroidal anti-inflammatory drugs (also known as NSAIDs) such as aspirin or ibuprofen. 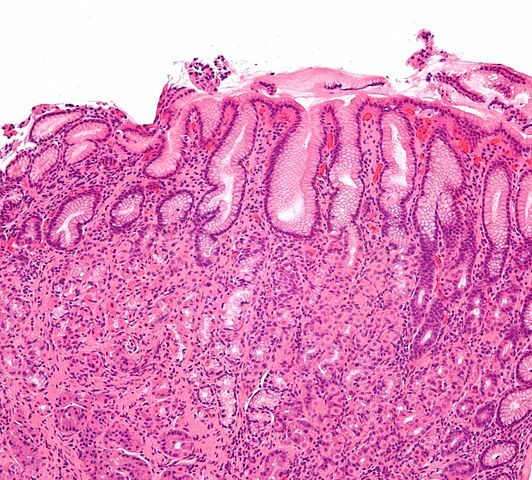 Sometimes gastritis develops after major surgery, traumatic injury, burns, or severe infections. Gastritis may also occur in those who have had weight loss surgery resulting in the banding or reconstruction of the digestive tract. Chronic causes are infection with bacteria, primarily Helicobacter pylori, chronic bile reflux, stress and certain autoimmune disorders can cause gastritis as well. The most common symptom is abdominal upset or pain. Other symptoms are indigestion, abdominal bloating, nausea, and vomiting and pernicious anemia. Some may have a feeling of fullness or burning in the upper abdomen. A gastroscopy, blood test, complete blood count test, or a stool test may be used to diagnose gastritis. Treatment includes taking antacids or other medicines, such as proton pump inhibitors or antibiotics, and avoiding hot or spicy foods. For those with pernicious anemia, B12 injections are given.